a book review by Renee Hand: Animal Parade: Puzzle Book—With a 6-Piece Floor Puzzle! 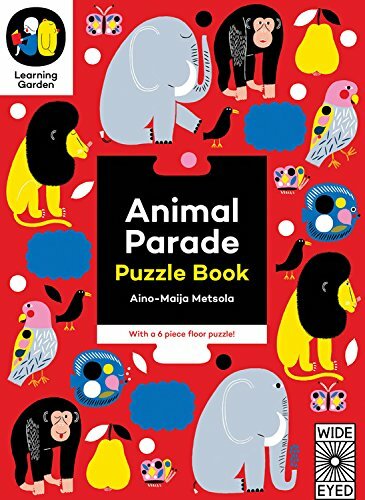 Animal Parade makes learning fun with its stylish and tactile design as a puzzle book introducing the key concepts of bigger and smaller. The six double-sided chunky puzzle pieces form two different floor puzzles and feature animals great and small, from a little ladybird to an enormous elephant! Once the pieces are taken out of the book they need a little use to soften up as they are very stiff. Children will need help at first. Putting them back into the book is just as difficult. The more the pieces are played with the easier they are to take out and put back into their spots. The story is very simple on the pages with the child connecting the puzzle pieces together to illustrate small animals to big animals and then flipped to show the reverse when finished. Children who are three years of age will identify with this book easier than the recommended two years old. Once concepts are introduced a three year old can pick up on its concept and repeat words and manipulate the pieces, eventually doing the puzzle by him- or herself. Two year olds will have a harder time doing this. Overall, this new puzzle concept is a great idea for teaching children about size in a fun animal fashion. It will become a child’s new favorite book, not only because of the precious parent and child time it initiates, but because the child will be able to play with it alone.